BEIJING, July 19 (Xinhua) -- Premier Wen Jiabao called for intensified efforts to save energy and reduce emissions over the next five years to ease climate change and promote sustainable development. 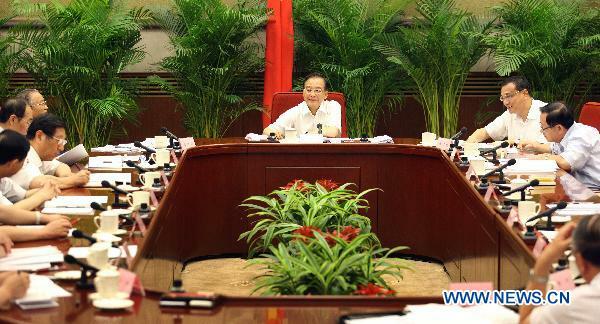 The country fulfilled most of its binding energy-saving and emission reduction goals set out in the nation's 11th Five-Year Plan period (2006-2010), according to a statement released after a State Council meeting presided over by Wen. China's energy consumption grew at an annual rate of 6.6 percent over the last five years, much slower than the 11.2-percent increase in the country's economic growth,the statement said. Greater efforts should be made to promote energy saving and emissions reductions in key areas over the next five years, and the country will continue to eliminate out-of-date capacity, develop public transportation, implement energy-saving projects and promote the use of energy-saving products, Wen said. He called for more efforts to optimize the country's industrial structure, develop service industry and strategic emerging industries, and build a safe, stable, economical and clean energy system. Wen also urged efforts to introduce advanced technologies to raise energy efficiency, reduce pollution, and strengthen energy-saving and emissions-reduction management. The country will press ahead with reforms of resources taxes and environmental taxes, and adjust import and export duties to curb exports of high energy-consuming and high-pollution products, he said. The State Council agreed that the country will push forward the international climate change negotiations under the principle of "common but differentiated responsibility." It also reviewed and approved a 2011-2015 work plan on energy-saving and emissions reduction in principle.